OK so this is probably going to sound a bit weird, but since British Summer Time ended last month, I've become a bit obsessed with clocks. Proper, good old fashioned, ticking clocks - not digital ones, or the ones we all have on our phones. For the first time ever, this year I didn't have any proper clocks to have to manually adjust the time on and it made me feel really sad. In the past I always loved listening to the gentle sound of a ticking clock as I drifted off to sleep. I had a weird deja vu thing when I was shopping in Laura Ashley a couple of weeks ago; it made me think back to my childhood and on a bit of a whim I picked up this duck egg blue, mini retro alarm clock for my bedside table. Now when I wake up in the night I LOVE that I don't have to reach for my phone to find out the time. I always hated being blinded by the bright white light of the screen and being tempted to do a bit of late night tweeting. I love the sound of the alarm waking me up in the morning, rather than Taylor Swift 'Shake It Off', which had been my previous alarm tone of choice (Daisy's actually). Clocks are just so traditional and so simple. You may have noticed that I'm trying to leave my phone alone a bit at the moment. I'm so conscious that I rely on it for everything - and I'm not just talking about the time. I make lists on it, I do my banking on it, I use the sat nav constantly, I use it as my main camera and I'm forever wiling away the hours on social media. 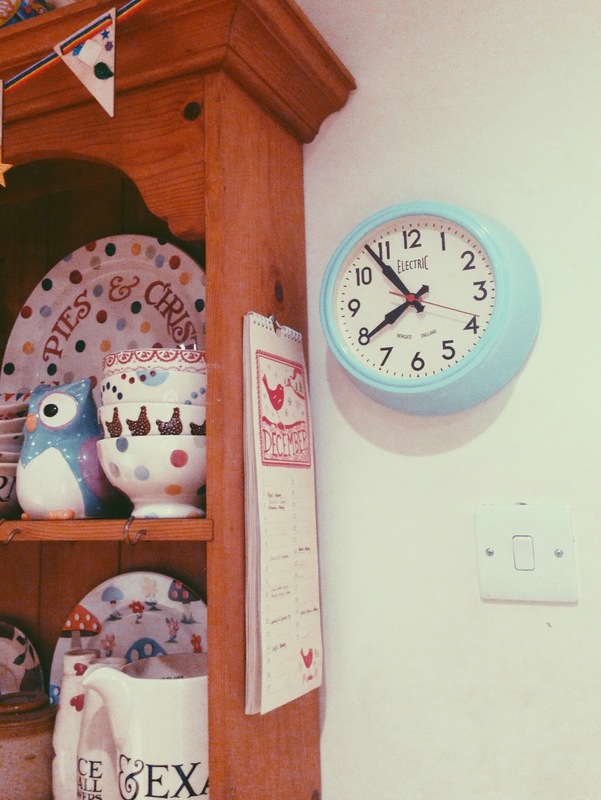 So I decided it was time to get a gorgeous kitchen clock too; one with a proper second hand so I can time things properly while I'm cooking and generally just PUT THAT BLOODY PHONE DOWN! 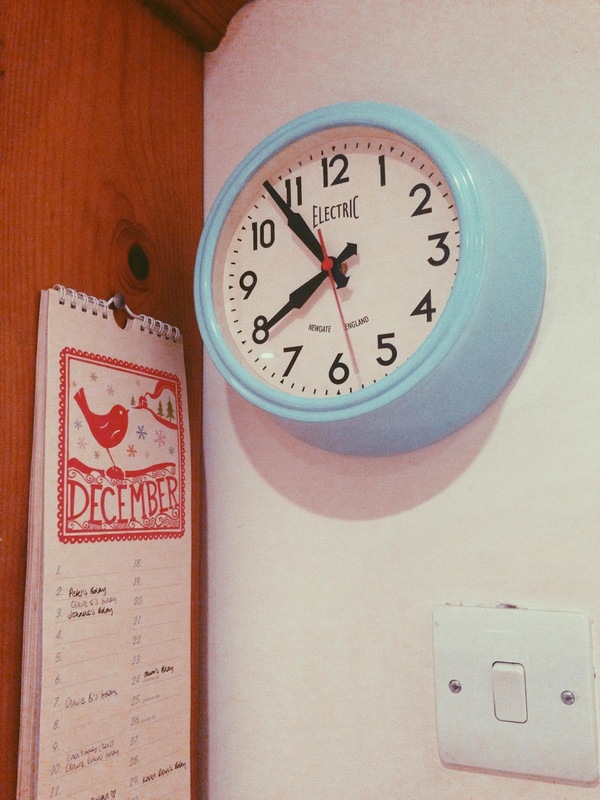 The company Red Candy, who I've worked with before (you can read my review of their butterfly coat hooks here) asked me if I'd like to review something from their online store ahead of Christmas so it seemed like the perfect opportunity to choose a kitchen clock. 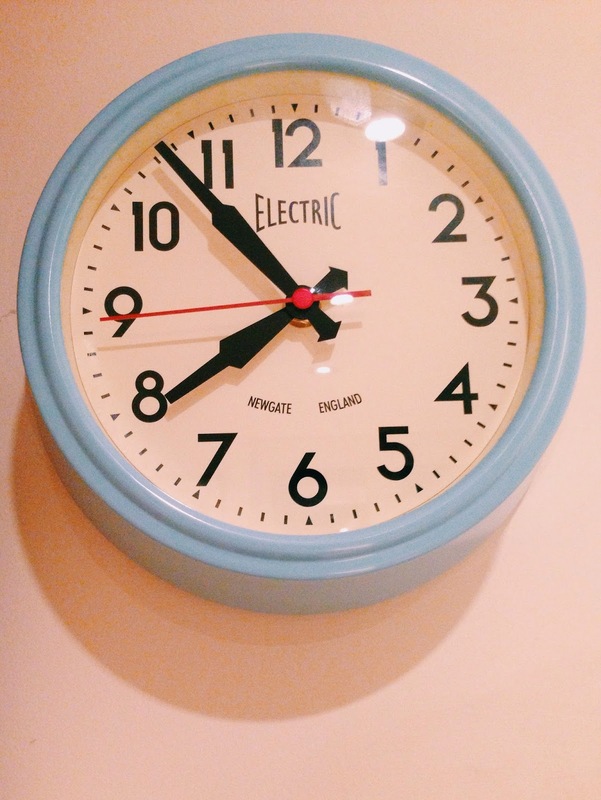 I opted for this Newgate electric wall clock. How cute? It's 21.5cm across so fairly compact, but is encased in a thick, bright-pale blue (is that even a colour?) metal surround which really makes it stand out. And so my new obsession with clocks was born! Next up I'm looking for a mantel clock for the front room. I've been looking at vintage ones on eBay, but am also rather fond of this retro-style one which is also from Red Candy. The Newgate Small 50s Electric Wall Clock is available in lots of different colours and costs just £36.00. It's perfect for kitchens, bathrooms or bedrooms. 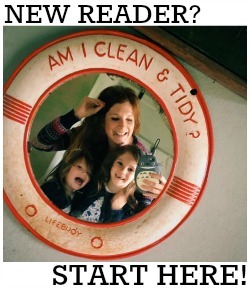 Check out the Red Candy website here for more gorgeous homewares. saxfordhawkins Jewellery - A Giveaway! Ruby and GINGER - A Review & Giveaway! All content copyright Katy Dial 2014. Powered by Blogger. © Modern Mummy. All rights reserved.